What a band of brothers this is! 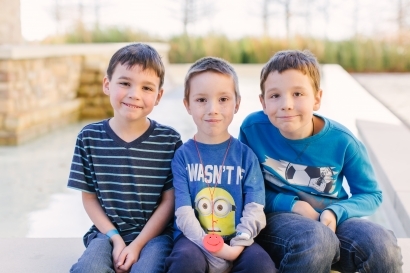 Steven, Mayson, and Gabe definitely have their own personalities and strengths, but they are absolutely brothers and love being together. Older brother Steven is the leader. He doesn’t like onions, so none of the brothers like onions! Steven loves being helpful, playing outside, and pretending to be super heroes, but he is also strong willed and struggles at times with following directions and getting along with his peers. Mayson is unique in that he has some physical limitations, but they do not hold him back from doing everything he wants to, although sometimes if he’s feeling sorry for himself he might try to use those as an excuse. But don’t let him fool you…Mayson is outgoing and talkative, and he loves exploring, riding bikes, and being outdoors. Gabe is the youngest of the bunch and he likes what his brothers like – being outside, riding bikes, and playing super heroes. Gabe is quieter and reserved, but he’s also super affectionate and loving. He’s a great student and a big helper, too…especially with his brother Mayson. But Gabe also can be prone to bending the rules to get his way and he doesn’t always follow directions like he should. The boys need a two-parent home that is resourceful, patient, flexible, and active. Experience with navigating special needs accommodations and advocating with a child’s school is also a plus, and no indoor pets. These brothers are full of amazing potential in the right environment!